A writing competition aimed at discovering Ireland’s best young travel writers has been announced by the organiser’s of the Immrama Festival of Travel Writing, which is set to take place in the heritage town of Lismore in County Waterford this June 13th to 17th 2018. The closing date for entries is May 18th and submissions can be made via www.lismoreimmrama.com/studentcompetition The judges for the 2018 competition will be Stephen Kavanagh CEO Aer Lingus, Vickie Stevenson Director CX Emea at AirBnb and Phil Cottier CEO of The CX Collection. “The 2018 competition offers entrants two category opportunities, one for students in the Junior Certificate cycle, (First to third year) one for Leaving Certificate students (Transition year to sixth year).” The winning students from both categories will be awarded an iPad mini and a €100 Amazon voucher each and the teacher of the winner students will each be awarded a €250 Aer Lingus voucher plus tickets to the Immrama Festival of Travel Writing 2018. The 2017 winner of the competition was Georgina McNamara a 4th-year student from Newtown school, Waterford. 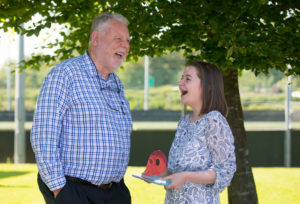 Georgina was presented with her award by author Terry Waite at the 2017 festival. Georgina’s piece was called New Beginnings and it can be read online at www.lismore-immrama.com/studentcompetition. The sixteenth annual Lismore Immrama Festival of Travel Writing has a stellar reputation for celebrating and sharing world-class travel writing and the 2018 festival line-up offers another stellar line up of internationally renowned writers and broadcasters. ‘New Beginnings’ the wining short story of the 2017 Immrama Young Travel Writers Competition by Georgina McNamara or Newtown Park School, Waterford. “Look! Look Anna! Do you see it? Do you?” I open my eyes slowly and look resignedly to my right. I’d forgotten how persistent Klara was when she wanted my attention. And now, in her excitable state, she was determined not to be ignored. “Ireland!” Klara squeals, as if she thinks I’ve forgotten where we’re going to live. A whole new family… It’s easier for Klara. She was so little when mama and papa died; she can barely remember what having parents felt like. All she can talk about is meeting Mister John and Miss Alannah, our new parents, as if the old ones never existed. I should be excited. Nadia, our orphanage matron, told me that there are tens of thousands still waiting in the Ukraine to be evacuated, that Klara and I are lucky to be alive and I should be grateful that a nice Irish couple wants to adopt us. Nadia was not nice. Nadia was always mean, to me, at least. She loved Klara. Klara’s perfect little smile, Klara’s happy little face, Klara this, Klara that. Always ‘why can’t you be more like Klara? She is not miserable, she does not think only of herself’. At five years old, Klara has very little understanding of what’s happened in the last two years. All she understands is that we’re going to a magical country where everything is green and there is no danger because everyone is happy and peaceful. She is not sad to leave behind the only home we’ve ever known, because she never really knew it in the first place. Not like me. My throat feels tight suddenly and I try to breath in and out quietly so Klara doesn’t notice. I stare determinedly at the sun shining in through the airplane window in a vain attempt to stop my tears from falling. It’s no use. Suddenly it’s all flashing through my head. Mama and papa dying. The crying as a child in the orphanage dies. Being constantly afraid that Klara will die, and then I’ll be left all alone in the orphanage with no one who cares about me. “Let’s play a game!” Klara declares suddenly, making me flinch in my seat. Thankfully, Klara doesn’t seem to notice. “What’s the first thing you’re going to do when we arrive in Ireland?” She continues, unstoppable in her tirade. I sigh. “I don’t know, Klara. Sleep?” She looks at me, exasperated. “Bo-ring. I’m going to go and play in the water at the beach. Nadia said they have beaches everywhere in Ireland, and that I could go every single day if I wanted to!” For some unknown reason, Klara’s determination that everything is going to be perfect and happy makes me even more miserable. Why can’t I be happy like her? Why do I constantly feel like I have this hole in my chest? “I’m going to find a bathroom,” I mutter to Klara. I unbuckle my seatbelt and unsteadily rise from my seat, trying to make my way down the aisle without tripping over my own feet. There is a long queue for the bathroom when I get there. The plane is now shaking so much I can barely stay standing. Unexpectedly all I feel is rage. I’m trapped on a plane, leaving my home and the only connection I have to my mama and papa behind. My tears rise to the surface and start spilling down my cheeks. I have done exactly what I promised I would not do, and started crying. Panic overcomes all my other feelings and, not thinking clearly at all, I stumble to the back of the plane. I nearly fall over twice, but the only thought that enters my mind is to be by myself. Crouching against the wall, I lean my head back, close my eyes and try to stay calm. Everything will be fine. We will be happy. I’m distracted from my chanting by the form of a tall, dark-skinned woman coming to sit down beside me. I recognise her from the row of seats across from me. I stare at her, not knowing what she’s going to do next. “Hello,” she says, smiling at me. She’s all pearly white teeth and big dark eyes. She’s beautiful, I find myself thinking. “Hello,” I say back, figuring that’s the safest option. “You looked upset, I wanted to make sure you were okay,” she continues. I try to understand, but my English only goes so far. “Th-thank you?” I answer unsurely. “Is this your first time on a plane?” Is she asking me if this is my first plane journey? “F-first plane,” I say back. She smiles at my bad attempt to communicate. Her smile falters as she notices the small scars above my eyebrows. Small but painful reminders of what Ukrainian life has become. She looks back into my eyes and, for some strange reason, I feel like she can see into my soul. “You won’t be sad forever,” she says finally, shaking her head and pointing at me to make her meaning clear. And, for some reason, I believe her. A sound rings throughout the plane, interrupting us. “Come,” she smiles at me, “the plane is landing soon, we must sit down,” and, pulling me to my feet, she holds my hand and leads me back to my chair. Klara looks up as I return. “Where did you go?” She demands, looking at me crossly. “No where,” I brush her off. She looks out the window again before looking back at me, her smile faltering. “We’re going to be happy here, right?” Klara asks nervously. The conviction the woman had, the belief that I wouldn’t always be sad? Perhaps she’s passed some of that to me. I look into my little sister’s eyes, and finally, I believe the words that come out. “Everything will be fine. We will be happy.” We will be.